Escolher as palavras certas em um manuscrito científico é um dos fatores determinantes para o sucesso de sua publicação. Mas uma escolha precisa pode ser um problema para falantes não nativos(as) do Inglês, levando muitas vezes à rejeição de artigos que, apesar de possuírem qualidade científica, falham em transmitir a informação pretendida. This webinar will teach you the principles of proper word choice for academic writing. Anybody that aims to write academic papers, especially for publication in international journals and in English. You will gain an in-depth understanding about why word choice is so important in academic writing. You will learn how to evaluate and improve your own word choice for the most effective presentation. Please note that the webinar will be conducted in English. a.Which passage is easier to read? In this three-webinar series, participants will learn how to structure a manuscript, identify and avoid common writing mistakes, avoid plagiarism, and respond to reviewer comments. All the sessions will be delivered in English. The journal editor largely decides whether or not to publish an article based on the suggestions and opinions of peer reviewers. Generally, the critical comments of reviewers and the revisions required can be painful for the authors. Thus, researchers may become stressed and even grow diffident after receiving their the editor’s decision. In this session, we will explain how to provide adequate responses to reviewer comments in order to increase your chances of publication. We will also discuss how to properly paraphrase in your manuscript in order to avoid one of the most serious problems: plagiarism! Are you confused about when to write the abstract? Do you need help in understanding how to create an effective abstract? Let’s take a look at the steps you can follow. Also, you will learn about essential elements that would attract journal editors and readers. Often authors, especially early-career researchers, are uncertain about how to prepare a manuscript for submission. Although each journal has its own set of rules, there are a number of tasks common to all that should be considered during the submission phase. In this session, participants will learn how to make their submission complete, and thus make the work of the editor and reviewers easy. The focus will be on choosing the most effective words and the most common mistakes in grammar, style, and formatting. At first glance, structuring an article seems like a simple task. However, as researchers begin to write their scientific articles, they often find it difficult to structure their content into the IMRaD sections: Introduction, Methods, Results, and Discussion. In this session, participants will learn how to structure an original research article into the IMRaD sections. We will also share tips on how to organize bibliographic references. Have you received peer reviewer comments suggesting that your manuscript should be revised by a native English speaker? Would you like some tips on how you can avoid such comments? Researchers and doctoral students who want to learn to write a more effective introduction section in their manuscript. This webinar, which will be conducted in Korea, will cover different aspects of writing an introduction section of a scientific manuscript. Briefly, we will discuss IMRAD, content, and verb tense. Besides learning useful tips to enhance your writing in manuscripts, importantly, we will go through in detail the use of verb tenses specifically to make the paper submission ready. Note that the webinar will be conducted in Korean. This webinar, which will be conducted in Korean, will look at the basics of using the passive voice. We will learn how to form passive sentences; the different ways to write passive sentences; and when to use them over the active voice in manuscript writing. We will look at specific examples from scientific journals to see how voice is used in different parts of a scientific manuscript. 이 웹세비나는 논문 원고 작성에서 한국 저자들이 흔히 궁금해 하는 수동태 사용을 다룰 것입니다. 수동태 사용의 기초를 배우며 실질적으로 과학논문에서 어떻게 사용이 되는지 여러 예시들을 통해 살펴볼 것입니다. 수동태 문장을 만드는 방법 및 다양한 수동태 형식의 문장들을 배우며 과학논문의 각 섹션에서 수동태와 능동태가 어떻게 사용되는지 배우시게 될 것입니다. Did you know that you can delay your publication success merely by poor English communication? International journals with a global readership are published in English, and your manuscript language quality and presentation are among the first things a journal editor will notice in your submission. To conquer language barriers and learn to communicate your research effectively, join David Kipler for his webinar ‘Ensuring quality English language in your scientific paper’. This webinar which will be delivered in Korean. You will understand why ESL authors fail to write clearly and coherently in English. The contents of the webinar are tailored to the Korean audience, explaining key differences between Korean and English and common misconceptions in technical writing that lead to poor readability and clarity when authors write scientific manuscripts. We will explain through examples how you can increase clarity at various levels of the text. 이번 웹 세미나는 시리즈 중 첫 강의입니다. 논문 원고의 섹션 중 서론 부분을 다룰 것입니다. 먼저 서론 작성에 있어서 서론의 내용과 조직 같은 기본 개념들을 살피고 이 섹션에서 유용에게 사용할 수 있는 영문 작성 팁들을 배울 것입니다. 이번 웹 세미나의 주요 섹션인 서론에서의 시제 사용을 구체적인 예들을 통해 배우고 양질의 논문을 쓰는 방법을 익히게 될 것입니다. A última aula do curso será dedicada à falsificação e fabricação de dados, conflitos de interesse e ao reconhecimento de serviços de revisão em artigos publicados. Também discutiremos sobre atribuição de autoria e sobre as armadilhas que editoras e revistas predatórias utilizam para atrair autores. Minicurso "Seja um pesquisador responsável: publique com ética"
O minicurso é composto por três aulas que abordarão o comportamento ético para a boa qualidade da pesquisa científica. A conduta antiética existe tanto dentro como fora do contexto do mundo acadêmico. Casos rotineiros de trapaça, fraudes e golpes são exemplos de comportamento antiético que têm consequências graves, passíveis de punição. Na Academia, a conduta antiética também pode ter desdobramentos sérios. O desenvolvimento de boas práticas em pesquisa ética ajuda os autores a publicarem seu trabalho de forma responsável e a evitarem assim rejeição e principalmente retração devido à má conduta. Além de acabar com uma trajetória profissional, a má conduta fere gravemente a integridade da Ciência. Neste curso, forneceremos orientação sobre quais são os preceitos éticos em publicação e como não cair em armadilhas durante o processo. Nessa aula, iniciaremos a exploração de condutas antiéticas específicas. Aprenderemos sobre plágio, submissão simultânea, duplicação e fragmentação de artigos. Para cada conduta, discutiremos o que fazer para evitá-la e quais podem ser as suas consequências. •Researchers and doctoral students who want to learn how to avoid common errors in manuscript writing. This webinar, which will be conducted in Korea, will cover some of the common errors in manuscript writing made by Korean authors. Specifically, we will look at errors in modifiers and noun strings. First we will define modifiers, which can be both a word or a phrase, and noun strings. Then we will learn how errors in modifiers and noun strings form, how to detect them, and how to avoid them in scientific writing. 이 웹세비나는 논문 원고 작성에서 한국 저자들이 자주 범하는 오류 중 수식어 사용과 명사 문자열 사용을 다룰 것입니다. 영어에서 수식어와 명사 문자열의 사용을 살펴보고 어떤 오류들을 범할 수 있는지 다룰 것입니다. 이 웹세비나를 통해서 이런 오류들을 발견하는 것과 피하는 방법들을 배우시게 될 것입니다. China is well on its way to becoming a world leader in research output. It is therefore critically important for Chinese journals and publishers to become global names and keep pace with China’s rapidly growing stature in scientific research. So how do international journals maintain and advance their standing? This webinar addresses the “business” of maintaining and advancing a high-quality international journal, delving into what it is that prestigious journals routinely do to attract prospective authors, promote their journal’s identity, and engage a broader readership. In the first part of this webinar, Professor Mcloughlin will share best practices leading journals follow to engage high-status author prospects, promote the work they publish, increase awareness of their best features, and remind potential contributors about their journals’ publishing opportunities. In the second part of this webinar, Mr. Rout will talk about how a growing number of journals today are pioneering the use of non-traditional content formats—jargon-free content and audio-visual summaries to increase the visibility of published research, and thereby reach out to and engage with a broader readership. Note that the webinar will be conducted in English. Editorial staff of academic journals who want to promote a more international footprint for their journal, who want to reach a reading audience outside their own nation, and receive submissions from researchers working internationally. This webinar helps editorial staff learn from the practices of prestigious journals by sharing easily reproducible strategies for improving the academic reputation of a journal. Na primeira aula do curso, conversaremos sobre as bases éticas em pesquisa e publicações. Também abordaremos a detecção de erros honestos e má conduta em artigos. Encerraremos a aula com a retratação de artigos publicados. Este webinar é parte integrante do minicurso "Fundamentos para um artigo de sucesso: escrita, publicação e divulgação", aula 3 de 3. A Carta de Apresentação ao Editor e o Resumo são o primeiro cartão de visitas de um manuscrito. Já o Título, o Resumo e as Palavras-chave desempenham um papel fundamental na disseminação de um artigo publicado. No entanto, nem sempre autores e autoras investem tempo adequado na sua elaboração, prejudicando assim as chances de aceite e o alcance de suas pesquisas publicadas. Venha aprender conosco como promover o seu artigo a partir destes elementos! 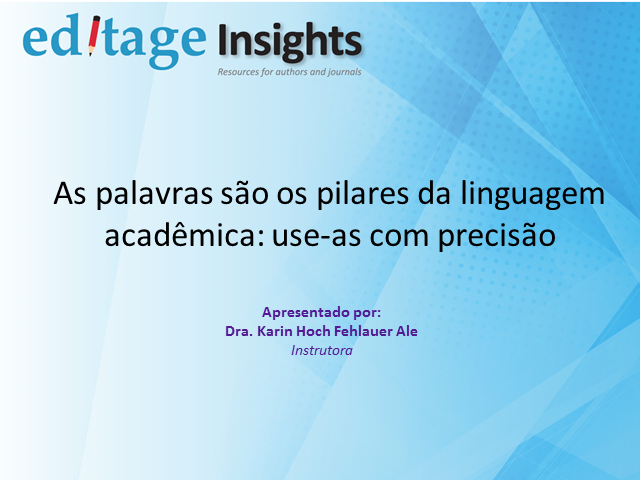 Este webinar é parte integrante do minicurso "Fundamentos para um artigo de sucesso: escrita, publicação e divulgação", aula 2 de 3. Autores e Autoras cuja língua materna não é o Inglês muitas vezes sentem dificuldade enquanto escrevem os seus manuscritos. E, ao receberem as revisões após submissão, ficam ansiosos aos receberem comentários de que o texto precisa ser reescrito para alcançar legibilidade e clareza. Sendo assim, é essencial transpor a barreira da linguagem. Através de exemplos práticos, vamos explicar como minimizar os problemas mais comuns de escrita acadêmica em Inglês, para que você possa transmitir o conteúdo de sua pesquisa eficientemente. Este webinar é parte integrante do minicurso "Fundamentos para um artigo de sucesso: escrita, publicação e divulgação", aula 1 de 3. Uma das razões mais comuns para a rejeição de um manuscrito é a sua inadequação à revista escolhida, resultando em atrasos na publicação. Além disso, a revista pode ser um critério indireto importante na medição do prestígio de um artigo publicado. Por isso, escolher a mais adequada é fundamental. Nesse módulo, você vai aprender a garantir uma seleção correta de revista, no momento ideal. Discutiremos vários fatores que precisam ser considerados no processo de seleção de periódicos, que vão além de métricas como Fator de Impacto e Qualis. Também compartilharemos uma lista para a verificação desses fatores. Why do authors choose to publish open access? In an ongoing survey by Editage Insights, many authors cite the main reason as “to increase research outreach”. But with more and more research papers being published every year, and more authors choosing the open access route than before, even open access is not enough to give your research the exposure it needs. Moreover, as a scientist, a publication is no longer the end of your research lifecycle. It’s increasingly important for you to find ways to make your research stand out and show its impact on society at large. This webinar introduces strategies you can adopt as an author to explain to broad audiences why your findings are important and how your work contributes to society. We will discuss the benefits of science communication in maximizing research impact, demonstrate the different content formats you can use to share your work, and offer you practical examples of what your peers are doing to increase the visibility of their work. Research professionals are eager to learn about developments in the publishing industry, but they are too busy with their research work to be able to invest time in their efforts to keep pace. Stay updated on the latest trends in publishing by attending these Editage webinars!